Earlier this week, we reported that Intel’s rumored first octa-core processor appeared with a 2.6GHz base frequency, but this forthcoming Coffee Lake-S chip might be faster after all. 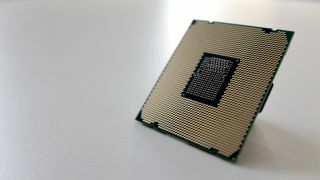 Intel's eight-core CPU appeared again in the SiSoft Sandra database running at a significantly faster 3.1GHz and the processor will likely be officially announced with even faster speeds. That’s based on just the fact that these are purported preliminary engineering samples, we can expect higher clock speeds as Intel moves towards qualification and test samples. In a bit of related news, PCGamesHardware claims to have spotted official documentation from Intel regarding the oft rumored and accidentally leaked Z390 chipset. The allegedly official documents show the forthcoming chipset will lend at least nine PCIe lanes towards USB 3.1 Gen2 ports, however, the total number of available PCIe lanes remains unchanged from Z370’s maximum of 24. With all these Coffee Lake-S and Z390 rumors coming so fast and furiously, it almost seems certain we’ll see both a new chip and platform officially announced at Computex 2018.